POWDER SOUTH HELI-SKI GUIDES was founded by a pair of noted ski and mountaineering entrepreneurs and guides: Rodrigo Mujica (IFMGA/UIAGM Guide) and Joaquin Oyarzun (former Olympic Skier). Both Rodrigo and Joaquin were born and raised in Chile and lived for years in the United States (Rodrigo spent two decades in Valdez, Alaska, and Jackson Hole, Wyoming). They have dedicated their lives to mountain life and to excellence in mountain guiding and adventure travel, which is why you will find no better or more professional heli-ski operation in South America than POWDER SOUTH. Rodrigo Mujica owns and operates both POWDER SOUTH and AVENTURAS PATAGONICAS, a respected high-altitude mountain guiding company, formerly of Jackson, Wyoming (and founded in Valdez, Alaska), now based in Boulder, Colorado, USA. Joaquin Oyarzun owns and operates POWDER SOUTH, KL ADVENTURE and ACONCAGUA EXPRESS in Chile. We proudly invite you to join us in exploring fresh powder, true adventure, and vertical challenge within the unsurpassed beauty of the Chilean Andes. We will do everything in our power to guarantee you have a safe, enjoyable experience in our mountains. 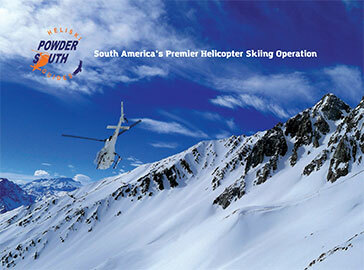 Come heli-ski the Chilean Andes with us!